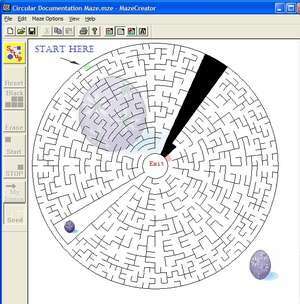 Free software to print random customized mazes with solution. Mazes can be customized in shape, drawn-on, add pictures, add text, and number of starting and stopping points. A mask can be applied to help rapidly develop new designs. You can save your work templates. Version 1.90 is a freeware program which does not have restrictions and it's free so it doesn't cost anything. For security reasons, you should also check out the Free Maze Creator download at LO4D.com which includes virus and malware tests. Additional screenshots of this application download may be available, too. Free Maze Creator has a presence on social networks.